I was just getting used to America First, even if it may have a little Russian dressing and a lot to answer for. How did that become Make China Great? 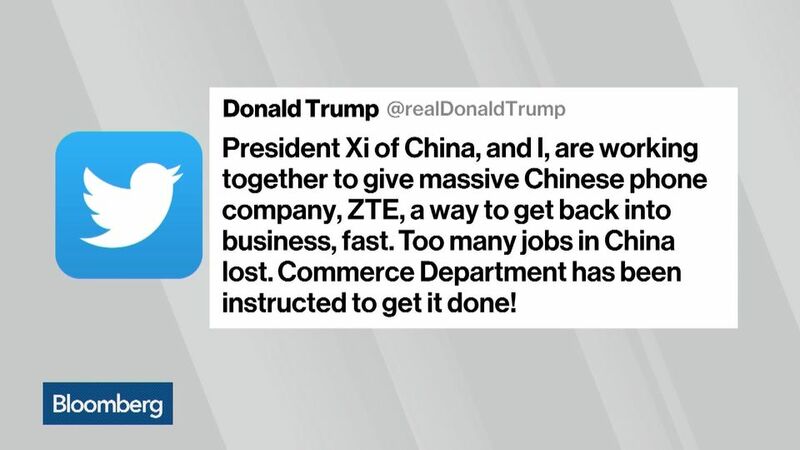 The strange incident seems to focus on efforts—OK, a presidential tweet—to save jobs that Chinese telecommunications giant ZTE says is costing us too many jobs. ZTE, which is not the largest telecom, said it is halting “major operating activities” after being punished by the U.S. Department of Commerce. So, President Trump surprised many in Washington when he tweeted that he was working with Chinese leader Xi Jinping to prevent the collapse of the company, which employs 75,000 over lack of access to American parts. That order seemed to come as a surprise to the, er, Commerce Department, which was said to be scrambling. “The overture appeared to be off-key for an administration that has been reliably strident on what it has called unfair Chinese trade practices. Mr. Trump’s concern in his tweet about Chinese jobs—which echoed Beijing’s talking point on the issue—also runs counter to his vows to restore American jobs lost to China,” reported the New York Times. The easiest way to explain it is that the United States needs China’s help right now in winning the desired de-nuclearized future of the North Koreas. The argument goes that if the United States were a little more reasonable about trade with China, the president would be taking pressure off the Chinese trade issue at a crucial moment. But there are darker explanations that we address in a moment about a Trump Organization financing need. Trump just did in a tweet what his negotiators have failed to do in weeks of talks with the Chinese, just by backing off. But then what is the point of the Chinese threats altogether? ZTE is a good example for Trump to use in his campaign to bludgeon the Chinese with a trade war over differing views about technology. Americans see government intervention on behalf of China’s tech companies, plus rules—formal and informal—that require U.S. businessmen to share parts of technology with them (intellectual property) and then manipulating prices as well. ZTE even violated American trade controls against Iran and North Korea. China sees over-reliance on American components in the tech sectors. This is the same company that Congress said it would not do business with because of national security concerns for its products being used in intelligence gathering. Mostly, however, I cannot help but think that once again, the Trump insistence on shooting from the hip merely to strike at campaign promises that may or may not have made sense is happening without thinking through the actual implications. That cross-tariffs between countries will interrupt complicated and overly involved manufacturing supply lines seems obvious from the get-go. Why has it proved to be a surprise to this government? So, instead of solving problems, we seem to be acting first, then standing back to see what happens. “We’ll see,” Trump says repeatedly. Later on Sunday, Trump tweeted again about trade with China. “China and the United States are working well together on trade,” he wrote. “Be cool, it will all work out!” But the about-face left many scratching their heads. As it turns out, the Trump Organization is pursuing an Indonesian leisure hotel and golf course and needs financing. Enter the Chinese government, which is partly financing the project. The White House struggled to answer how that kind arrangement does not abridge the Constitution’s emoluments clause against personal gain while in office, to say nothing of the president’s personal promise not to pursue new foreign business deals while he is president, to say nothing of whether he is trading on policy for personal gain. The answer was that the White House does not speak for The Trump Organization. Hmmm. Swampy. The company had already agreed last year to a $1.2 billion fine in connection with those violations. But now, barred from using American microchips, software and other components, ZTE has been facing the prospect of being unable to manufacture its telecommunications equipment and smartphones.